It seems like there’s a new celebrity fad diet every time we go down a grocery store aisle. Whether is Oprah declaring her love for counting points or Gwyneth Paltrow’s new $200 shake, there’s a lot to digest. Literally and metaphorically speaking. However, there’s no denying the power weight loss smoothie recipes have on our waistlines. 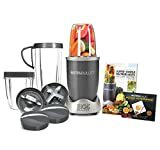 Made properly and correctly, tasty blender recipes for weight loss can be either a complete meal or substitute for an otherwise fattening snack. Use a quality blender to to blend up these filling and fat-burning weight loss smoothie recipes to catapult your weight loss goals. It’s been proven that consuming “good fats” can help curb appetite and boost metabolism. After all the ingredients are prepared, blend on high until silky smooth. Pro tip: To make this a completely vegan smoothie, swap out skim milk for either soy or almond milk. Greens are well known for their rich antioxidant, vitamin, and mineral levels. Because of the yogurt’s thickness, you may need to push it down toward the blade to mix thoroughly blend all the other ingredients. Pro tip: Be sure to cut into small pieces before blending. Berries are packed full of carotenoids, antioxidants, and other health benefits. Before you start blending this diet smoothie recipe, be sure the liquids have made their way to the blade. That way, they can blend well with the other frozen ingredients. Pro tip: For an extra boost of berry sweetness, add a tablespoon of your favorite jelly or jam. In past few years, mangos have grown in popularity as a weight loss aid. They’ve been proven, time and time again, to help support fat metabolization. If you can’t get your hands on fresh mango, frozen will work. However, you may need to add either a 1/4 cup more of almond milk or water to help it blend well. Pro tip: Capsaicin, the chemical that makes spicy food hot, has been proven to boost metabolism, as well. Sometimes we want a slice of birthday cake or a pint of our favorite ice cream. But dessert and weight loss don’t exactly go hand in hand. To ensure you haven’t over sweetened your birthday cake smoothie, start with four no-calorie packs of sweetener. Then, if you’d like to have it sweeter, add one pack. Possibly two. Pro tip: If you want it extra light and airy, add a 1/2 cup of fat-free Cool Whip. Chai is renowned for its anti-inflammatory and other calming qualities. Chia seeds help to aid digestion and reduce hunger, as well. Marrying the two together might seem odd, but trust us when we say it’s a delicious pairing. Depending on how thick you want your smoothie, the amount of ice you’ll add can vary. But to start with, use the amount recommended in the recipe. Pro tip: For an extra bit of flair, garnish your chia seed and chai smoothie with a dollop of whipped cream and a sprinkle of cinnamon. Protein, like fiber, is believed to help curb your appetite. It makes you feel fuller for longer. And what could be better for weight loss than that? Also, if you’re hitting the gym regularly, this diet smoothie recipe will help your body recover quicker from a hard workout. If you’re counting sugar, it may be worth purchasing unsweetened protein powders. This way, you can regulate your sugar intake more effectively. Pro tip: it’s believed the average man or woman can only assimilate (digest) about 30 or 40 grams of protein at once. So there’s no need to go overboard on the protein powder. Have any weight loss smoothie recipes of your own to share with us below?